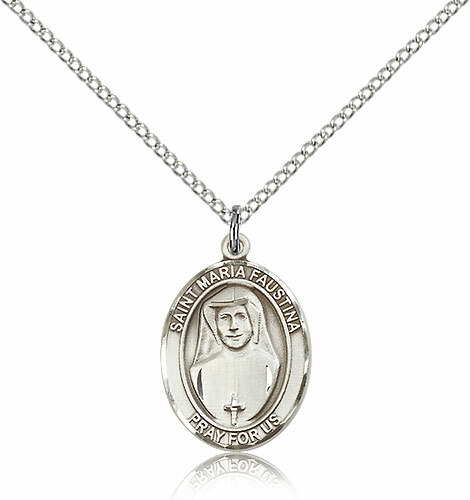 Sterling Silver Medal of St. Maria Faustina with a stainless steel chain, available in 3 sizes. Size small is 1/2" x 1/4" and comes with an 18" chain. Size Medium is 3/4" x 1/2" and comes with an 18" or 24" chain. Size Large is 1" x 3/4" and comes with a 24" Chain. St. Maria Faustina is the Apostle of the Divine Mercy. Memorial: Oct 5. When in her teens, Maria served many families. She later became a nun, and during this time she wrote about her experiences with visions and the stigmata. A translation of her works is now called 'Divine Mercy in my Soul'. Made in the USA. Details on jewelry may vary, dependent on size of medal chosen. "Gold Filled" refers to a process by which gold is bonded to a base medal, with a much higher gold content than Gold Plate. It is considered a life-time product, as the gold layer will not quickly wear off, as it will in electroplated products.